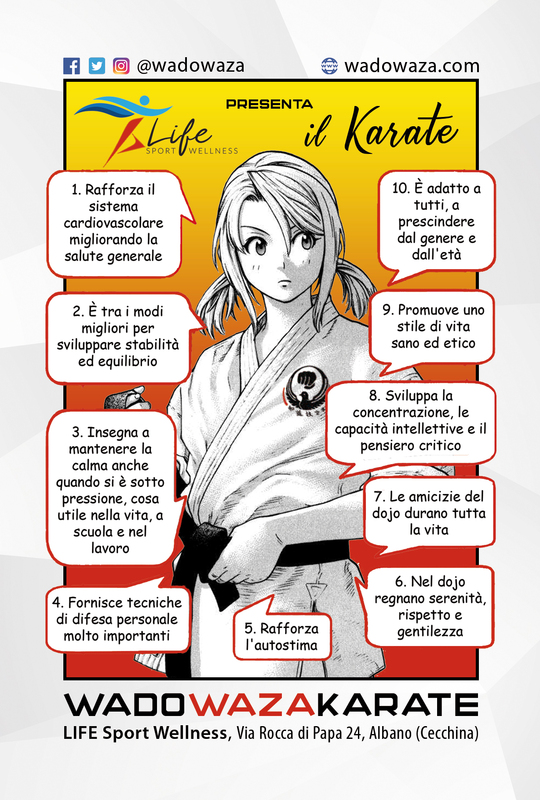 Our dojo is hosted by the Life Sport Wellness center in Albano Laziale, in the Cecchina area, in a beautiful facility having a 25 meter Swimming Pool, a large Body-Building room, the best equipments available on the market, various fitness areas and three sound-proofed rooms for the martial art’s and hollistic classes. Among the activities offered by Life Sport Wellness, in addition to karate, we find various courses of swimming, water-gym & water-step, body building, omnia, fitness, cardiofitness, pilates, triathlon, dance and the innovative Gympx – Right Postures. Both the karate classes for children (up to 12 years of age) and the evening trainings for adults and teenagers (from 13 years upwards) take place in the Green Room (over 100 square meters), while the Blue Room (about 80 square meters) is available for special trainings on the weekends. Both the rooms are air-conditioned, have large mirrors on the walls and are paved with high quality cushioned real-wood parquet. The facility is modern and clean. There is a comfortable reception area and a small coffee bar, with TV and sofas.